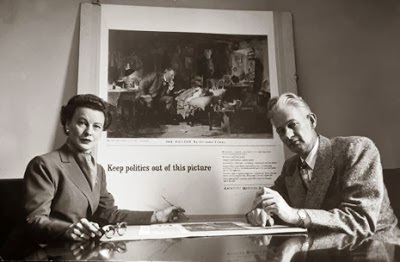 An earlier post on this blog provided a bit of California political history regarding Clem Whitaker and Leone Baxter, the couple in the photo, who developed an approach to campaigning in the 1930s. As we noted, they developed a network that provided editorial content to newspapers around the state, pushing whatever cause they were paid to promote. Our earlier post is at http://uclafacultyassociation.blogspot.com/2013/10/more-on-pension-initiative-coordination.html.